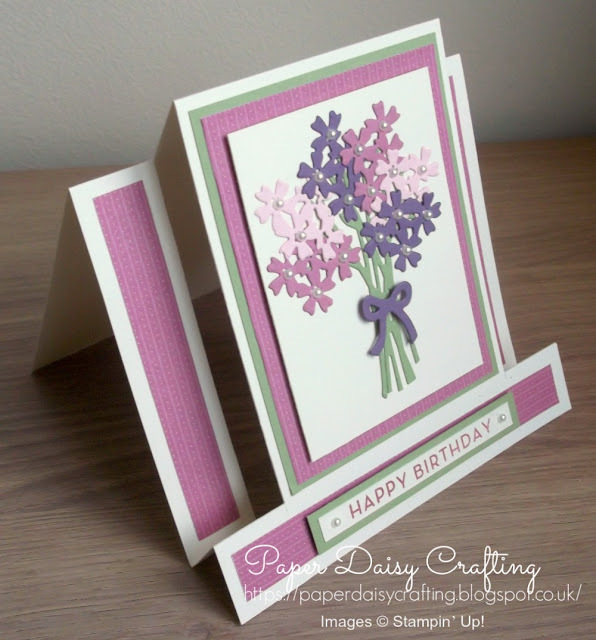 Paper Daisy Crafting: Birthday card using Bouquet Bunch dies from Stampin' Up! Birthday card using Bouquet Bunch dies from Stampin' Up! I hope you caught my blog post and video tutorial yesterday, showing how to make the structure of this card. Today, as promised, I am showing how I decorated the card blank to make the card above. I have another short video tutorial for you HERE (or click on the image below). Narrow side panels: 5/8" x 4"
Narrow bottom panel: 5/8" x 5 5/8"
Pear Pizzazz mat - 4 1/4" x 3 1/4"
Petal garden mat - 4" x 3"
Cream panel - 3 3/4" x 2 3/4"
Hope you've enjoyed today's project.